Millbrook HS., Winchester, VA:On Saturday February 2nd the Falcons wrestled in the first level NW District Wrestling Championship and came home with the first-place trophy for the 14th time in school history. Yes, as Coach Doug Fisher will say "our season ending goals are still not obtained." But on this Saturday, it came down to the very final match for Fauquier’s 285 lb. Thomas Heisler earning a 3rd period pin over James Wood to seal the Northwest District Championships for team Fauquier. Moments later team Fauquier and its 14 bleached blond hair wrestlers once again were standing on top of the awards podium in Millbrook’s HS. gym grasping the Northwestern District trophy and claiming the back-to-back slogan. Clearly, 14 District Championship titles is the most in Fauquier County by any high school athletic program. But this victory is the 7th time since 2011 that Coach Doug Fisher has led the Falcons into the post season with a District Championship crown, pretty remarkable to say. Coach Fisher has a history of pulling his troops together this time of the year regardless of the temperature outside or with tournament delays. Team Fauquier would hold the lead after the first round of the Championship Quarters with 66 points while advancing 11 wrestlers onto the Semi-Finals. Major wins came from 113 lbs. Reece Kuhns who won a 6-5 decision over Vince Caruso (James Wood) and 152 David DeWald who won by fall over Quinn McPartland (Sherando). Both Kuhns and Dewald beat a higher seeded wrestler. The Falcons then went 6-5 in the Championship Semi-Final earning bonus points in four matches. While boosting six finalists, Fauquier temporarily slipped back to second place with 146.5 points, 9.5 points behind Liberty who advanced seven wrestlers onto the Championship Finals. Known as the blood round the Consolation Semi-Finals is where Fauquier made a charge to once again capture the lead with 185.5 points. Team Fauquier earned six wins from 113 lbs. Reece Kuhns, 120 lbs. Nolan McEachin, 132 lbs. Gino Camarca, 138 lbs. Mitch Kuhns, 152 lbs. David DeWald, and 285 lbs. Thomas Heisler all recording maximum bonus points with pins. Winning the Northwest District Championships just by 3 points over Liberty is a small margin of victory but these six bout wins by fall could be the reason the 2019 NW District trophy now rests in the hands of team Fauquier. At this point, you had a sense that the 2019 Northwest District champion would boil down to just two teams, Fauquier and Liberty as they stretched away from the field. Both teams had more wrestlers on deck that potentially could continue to earn team and placement points. If you go back to look at the past two years, the District Champions and runner up had been exactly these two-wrestling teams. In 2017 Liberty HS. won the District title for the first time in their school history and last year’s Fauquier team won edging out Liberty just by 1.5 points. Most of the time post season tournaments break the gym down to a single mat so the fans and wrestlers are then showcased to a single mat highlighting the district’s best. But since the delay start time was moved forward, Millbrook HS. ran the event with the final round wrestling on three mats. Mat 1 would host the first place matches, mat 2 would then wrestle for third place and mat 3 would be wrestling for the fifth place. The participants on mats 1 and 2 advanced onto the 4A Region C Championships. While Liberty would have 12 wrestlers competing in this final round to earn team points, Fauquier would have one more with 13 Falcons on deck. Fauquier did square off with Liberty six times during the NW District Championships. Heading into the final round they had spilt 2-2 with the Eagles and would have two more on deck matches. Even with a 17.5 point lead, the sense from the coaches to the spectators was that every bout that Fauquier had was important as the first place trophy would now be unboxed and rested on a table near the awards podium waiting the winning team’s finger prints. 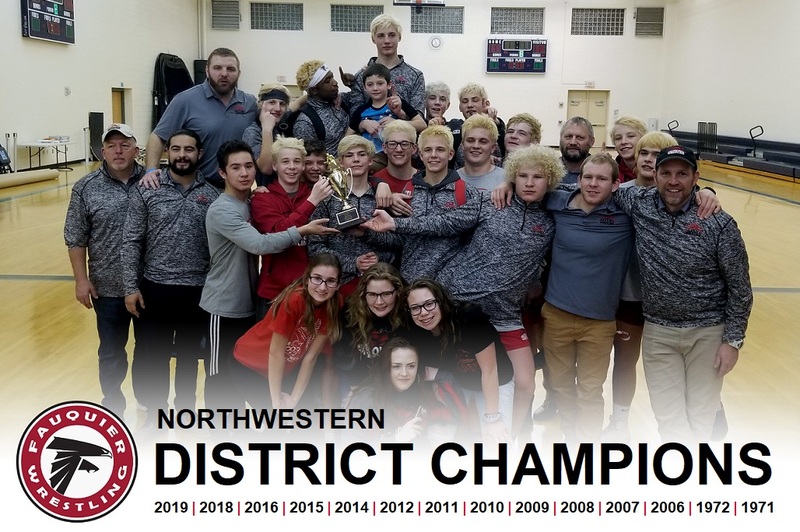 The 2019 NW District Championship really stands out as having the potential to be among the “All Time Greatest Moments and Achievements” list. More to come on why but you have to live-it, be in the moment, and feel the emotion to understand it. These “Greatest Moments” are quite obvious events that unfold and grab hold of Fauquier Nation. The desire for team Fauquier to bring home the first place trophy with 12 placers may be the underlying factor. As Fauquier only won four matches in this final round, Liberty made a charge by earning seven victories. Below I highlight the victories (only) as a short summary of those pivotal final bouts for team Fauquier. 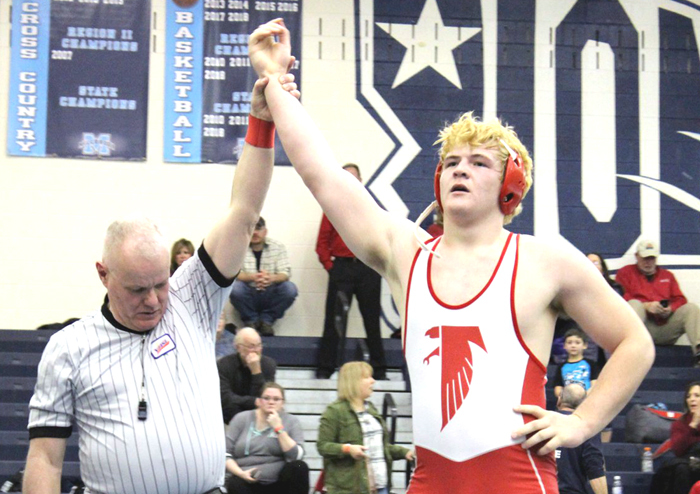 138 – Mitch Kuhns (Fauquier) lost in the Semi-Finals, then received a forfeit in the consolation semi-finals. Mitch Kuhns then won a 7-0 decision over Dean Ritter (James Wood) to take home the 3rd place finish. A much crucial match for team Fauquier as Kuhns was battling for Fauquier’s first team points this final round. As Fauquier lost bouts from 113 through 132 lbs. Liberty had victories at 106, 113, and 126 lbs. Kuhns win gave the Falcons +2 points to the overall team score as Liberty would now rest with 180 points. Fauquier improved to 187.5 points as the 17.5 points margin now had been cut to 7.5 points. 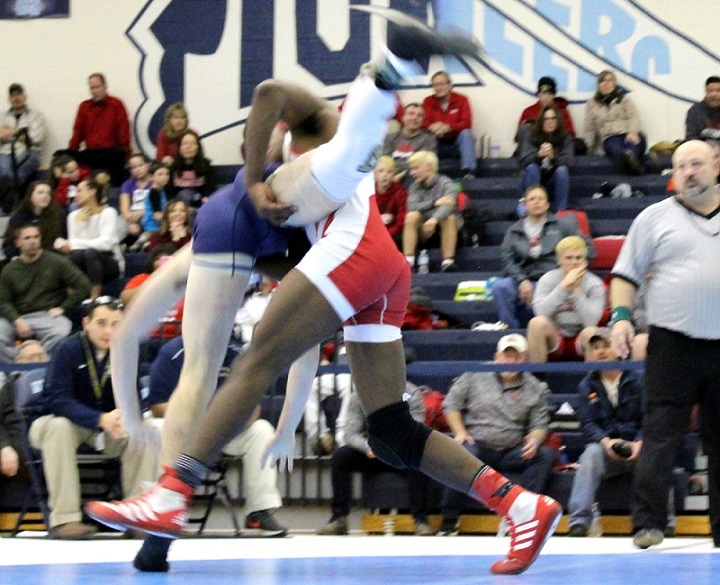 160 - Darryl Mayfield (Fauquier) won a 9-5 decision over Sam Adkins (James Wood). Mayfield rose to the occasion and came out with an aggressive style. Mayfield became the first Falcon to stand on top of the podium by winning the 160 lbs. NW District weight class. As the Falcons would fall at 145 and 152 lbs. weight classes this victory by Mayfield gave team Fauquier + 4 team points. But with Liberty taking victories at 145 lbs. (3rd place) and 152 lbs. (5th place), they were showing strength as Fauquier would still hold onto the lead by 7.5 points. Team score would have Fauquier with 191.5 points lead while Liberty held at 186 points after the 160 lbs. bout. 182 - Sam Fisher (Fauquier) won by tech fall (22-6) over Royce Hall (Liberty). Earning bonus in this match, Fisher also earned a fall over Justin Menijvar (John Handley) in the first round of the tournament. Sam Fisher becomes the 11th Fauquier wrestler that has won an individual District Champion Title 3X. This victory by Fisher would give + 5.5 team points to Fauquier boosting them up to 197 points still holding onto a 11-point advantage over Liberty as they would rest at 186 points going into to the 195 lbs. weight class. With three weight classes yet to compete, this is where the NW District Championship tightened as Fauquier and Liberty both had wrestlers on deck. Liberty took home victories in the 195 lbs. and 285 lbs. weight classes with pins and adding + 12 team points and had the Eagles jumping into the lead with 198 points over Fauquier with 197 team points.. The final 285 lbs. bouts on all three mats still had a Fauquier wrestler on mat 2. A moment that was surreal had Liberty’s 285 lbs. wrestler earning a 1st period fall and team Liberty celebrating the momentary overtaking of Fauquier and the NW District Championship lead by one point. . Team Fauquier needed a win from Thomas Heisler in this final match to capture the NW District crown. Unaware if Heisler knew the implication of a win or loss but all spectators and wrestlers in the Millbrook gym had drawn their focus to mat 2 and this third place match. 285 - Through the first period the bout score rested at 0-0. As Heisler selected the bottom position he was awarded with a penalty point (1 point) 40 seconds into this period, to go up by 1 point. Heisler then was able to earn an escape with 47 seconds remaining to take a 2-point lead heading into the 3rd period. As Heisler would start the third period on top he recorded a 3-point near-fall early through the period to go up 5-0 but within a few seconds Heisler was then able to turn Patterson-Campbell (James Wood) again and record a fall to seal the District Championship for team Fauquier. This pin by Heisler gave team Fauquier + 4 team points and a 3-point lead 201 points over Liberty with 198 points for the final team score. Q: Having 13 bouts in the champion final round with a lead of 17.5 points, what a finish. How did team Fauquier pull this off? Coach Fisher: "It was certainly a full team effort. Although many of our guys did not have the individual success that they were seeking, collectively we came together and did enough. The guys will enjoy the District Title for a day, but come Monday, we are back to work improving, adjusting and focusing on wrestling better next week at Regionals." Q: Team effort for sure, but to be down by 1 point during the 285 lbs. match and Thomas Heisler to earn a victory for the team - any word about this moment? Coach Fisher: "Tommy is a clutch guy. He is a very disciplined in his position, and wears guys out till they give and then he capitalizes. I felt very good about our chances with Tommy being our final shot at pulling out the District Title." Q: Any reflection on the toughness of the NW District? Coach Fisher: "It is fantastic to have such great competition in our District. It makes the tournaments and district competitions much more exciting and beneficial for our guys." Q: Team Fauquier qualified 12 wrestlers for the 4A Region - is this team peaking yet? Coach Fisher: "We are certainly gelling as a team, but we did not have a good last round at Districts. Our guys are not satisfied with their results in that round, are working hard this week on improving, and they are excited for the opportunity to have another chance at Regionals to compete." As the post season has begun and with the 4A States just two weeks away the 4A Region C is scheduled for next week at Heritage HS.